Not sure if you’ve heard, but the Ford Motor Company is getting out of the passenger car business in North America. Yes, it’s true. 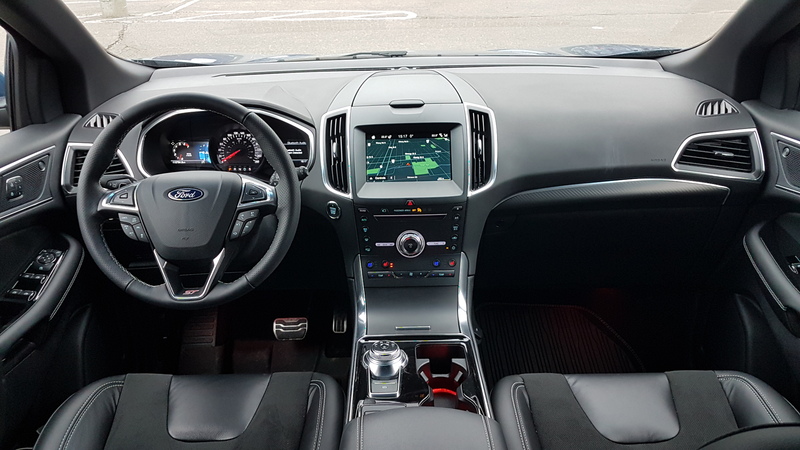 Last March, Ford confirmed it will be phasing out its passenger cars in Canada and the U.S. due largely to declining passenger car sales which currently account for just 25-30 percent of new car sales. 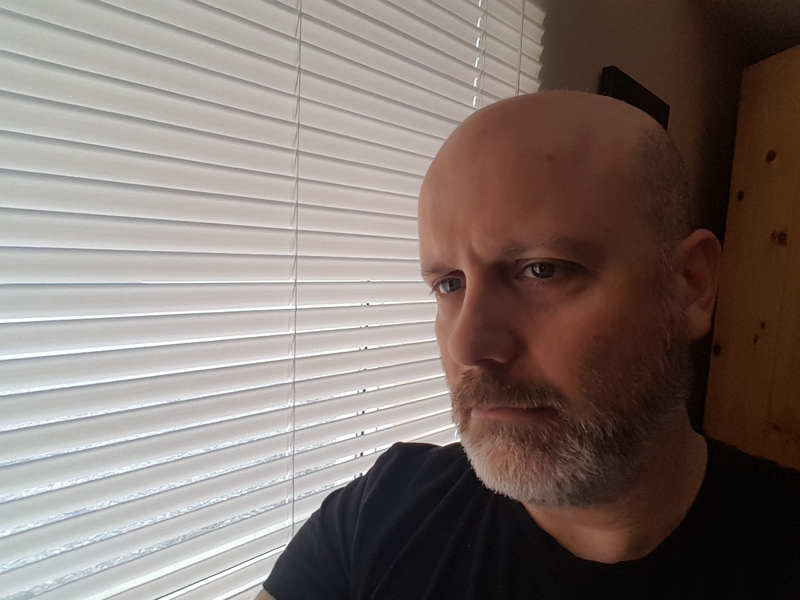 Ford’s claim that it is simply responding to shifting consumer preferences towards trucks and utilities is hard to dispute given current trends. 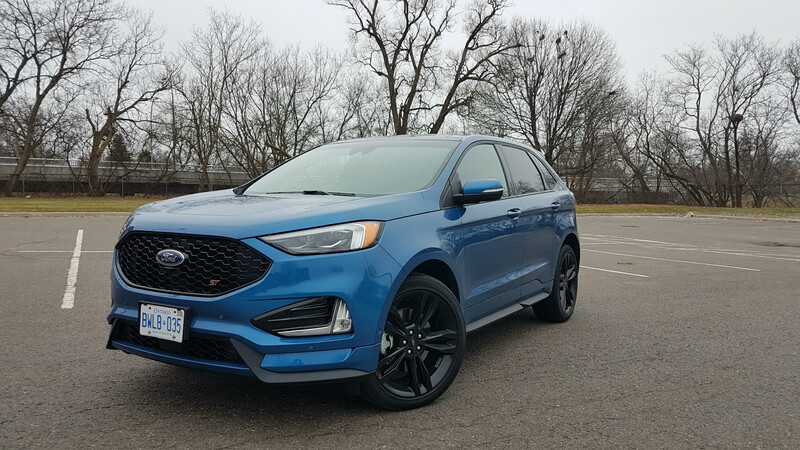 Now, your local Ford dealer should be well stocked with Fusions, Focuses and Fiestas for the time being, but over the next 18 months or so, these cars are all going to disappear. Relax, Mustang aficionados – your favourite pony car isn’t part of the culling and will live on for some time to come. And while this is good news for those interested in blue oval performance – all-new GT500 inbound! – you might be wondering what other options will be available moving forward. 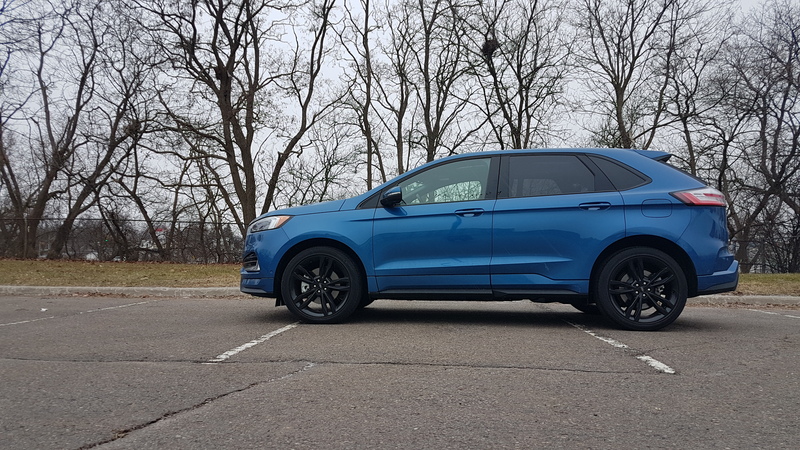 Well, let me introduce you to the Ford Edge ST, the first SUV entry from Ford Performance, the company’s in-house tuning arm responsible for the Mustang GT350 / 350R, GT500, GT supercar and F-150 Raptor. The first-ever Edge ST comes to market as part of a mid-cycle refresh for the entire ‘19 Edge lineup that brings with it styling changes (new grille, hood, headlights, tail lights, etc. ), drops the 3.5L V6 and swaps out the 6-speed automatic in favour of an 8-speed gearbox which is now the standard transmission. As you might expect, the Ford Performance tuning that goes into the Edge ST begins under the hood with the presence of a 2.7-litre EcoBoost (twin-turbocharged) V6 that produces 335 horsepower and 380 lb-ft. of torque and is paired with an 8-speed automatic and standard AWD. ST models also come with a specially tuned sport suspension, selectable traction control, transmission sport mode and steering wheel-mounted paddle shifters. 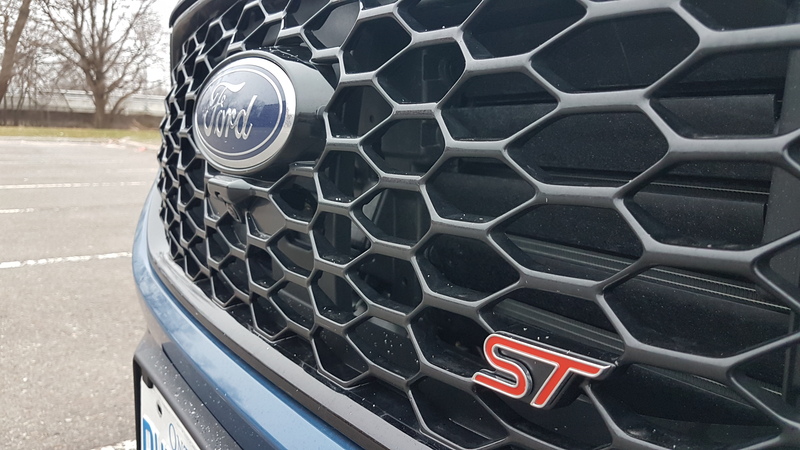 Like other performance models, the Edge ST also offers more aggressive throttle mapping for faster acceleration, a revised transmission shift pattern which will hold revs longer before upshifting, and a louder, sportier exhaust note. On the design front, Edge ST models sport a unique fascia with a large octagonal mesh-style grille, along with a wide air intake below the bumper for improved engine cooling. Along the sides of the vehicle are deep side skirts for more downforce, while the rear is finished with a large black plastic diffuser that houses a dual exhaust. Ford has also gone to some lengths to separate the ST from the rest of the Edge lineup cosmetically. Among these touches are unique 20-inch wheels (21-inchers are available), sport seats with extra bolstering, and a generous amount of ST badging (seat backs, steering wheel, tailgate, front grille, etc.). 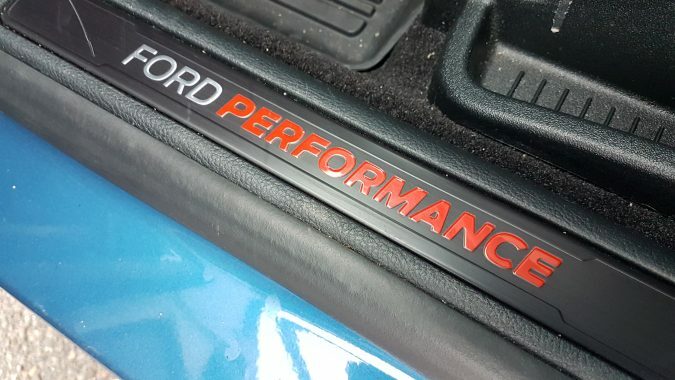 For the purposes of this review, Ford of Canada furnished me with a Performance Blue tester that includes a few extras. The big one is the 401A Equipment Group ($5,800) which comes loaded with a lot of content, including adaptive cruise control with stop / go and lane centering, evasive steering assist, cooled front seats (heated front seats are standard), heated rear seats, panoramic vista roof, perimeter alarm, remote start, wireless cell phone charge pad, hands-free foot-activated liftgate and more. The other option of note is a set of 21-inch painted aluminum black wheels ($950). This is a handsome vehicle. 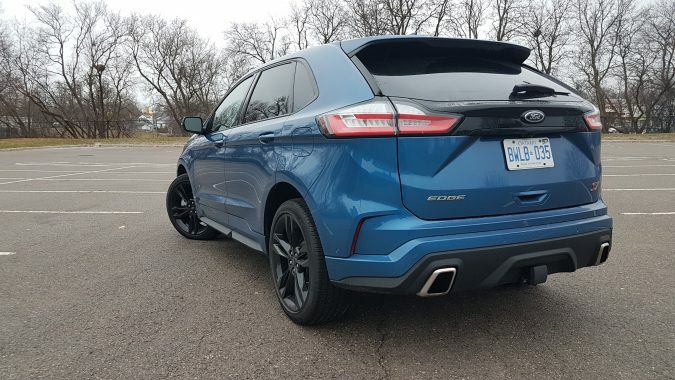 I agree that most, if not all, SUVs have a rather homogenous look – there’s only so much a design team can do with a two-box layout – but Ford’s designers have a done a good job of separating the Edge ST not only from other Edge models, but also from other SUVs. The sharpened look of the front end with its blacked-out octagonal grille and slim LED headlights suggests an accentuated performance character that the car backs up. The giant 21-inch black wheels, pronounced side skirts, blacked out rear diffuser and big dual exhaust finishers do their part to send a clear message that this is not a run-of-the-mill Edge. I think manufacturers tend to overdo it with badging on high-performance models, but Ford managed to keep the Edge ST’s badging to a reasonable level and has located them in logical places (steering wheel, seatbacks and scuff plates, although the latter is Ford Performance, not ST). 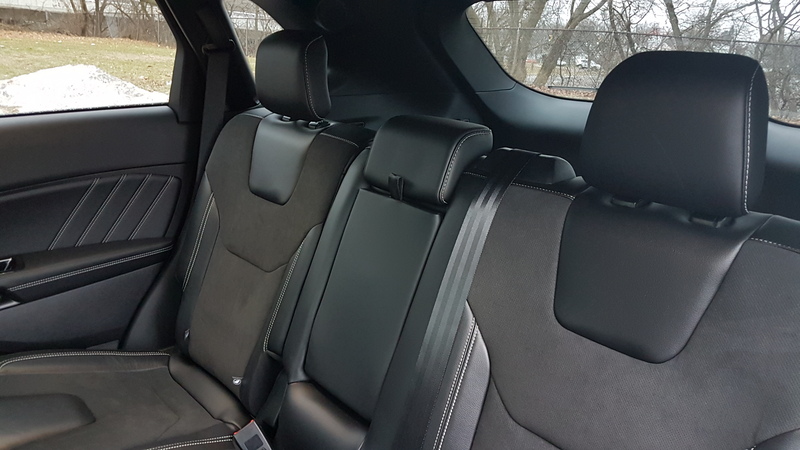 As for the interior itself, the level of content, both standard and optional is impressive. 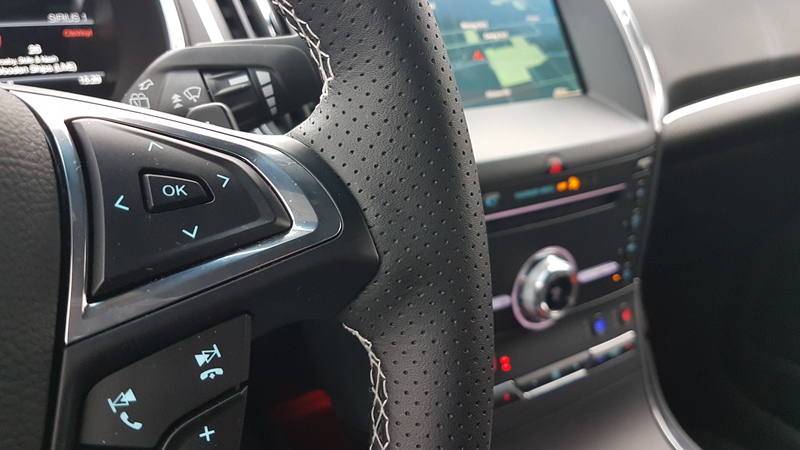 All the stuff you’d expect is there (colour HD multimedia screen, heated and cooled seats, heated steering wheel, leather and Alcantara-wrapped this and that, etc. 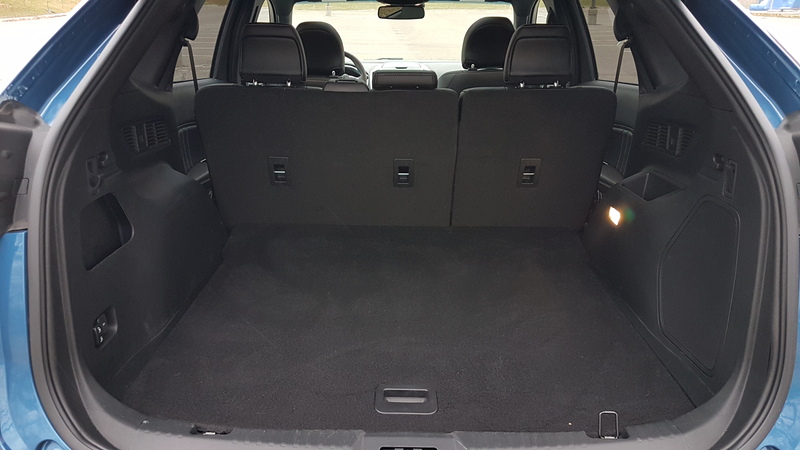 ), but more uncommon items are also present (cell phone charge pad, heated rear seats, panoramic roof, etc.). Somewhat less impressive is the general appearance of the interior which is starting to show its age. 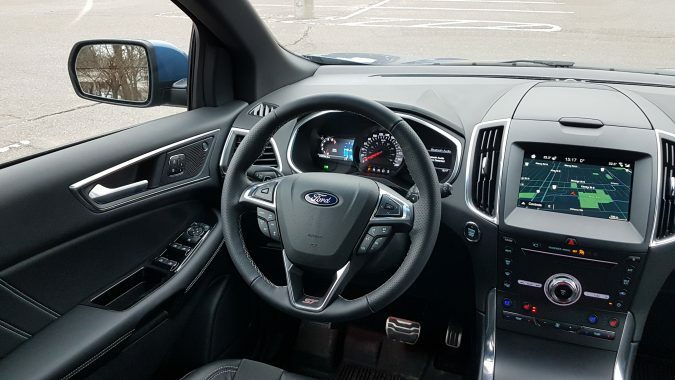 The 8-inch multimedia display and the digital driver information screens look fine and work well, but some of the trim pieces in the dashboard and centre console look and feel a bit old. 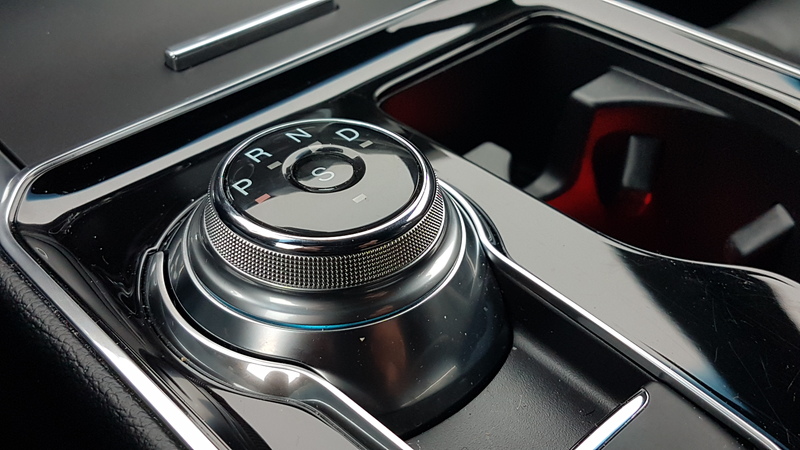 On the plus side, buttons and hard keys remain for heavy-use controls, and the rotary gear selector offers slick operation and good tactile feedback thanks to its metallic ring. In terms of the driving experience, the Edge ST delivers the goods as a high-performance SUV. I didn’t drive my test vehicle on a closed course, but it excelled in the daily driving situations I experienced during my weeklong test. The 2.7-litre EcoBoost V6 has a flat torque curve with peak output arriving at just 3,250 rpm, which makes for plenty of quick getaways from rest, while still providing for plenty of mid-range power for passing highway maneuvers. 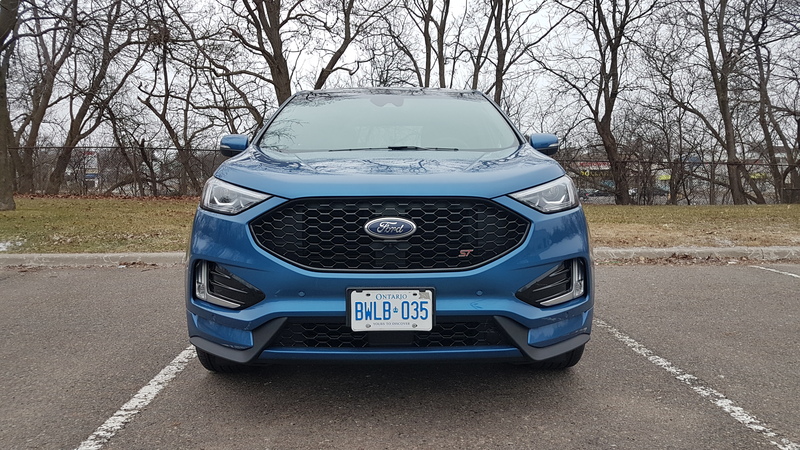 It’s a fast SUV in both normal and sport modes, but it’s more engaging to drive in sport when the revs are held before upshifting and one can make use of the paddle shifters. The ride quality was a bit stiff and jittery, as one would expect in a performance vehicle, but I didn’t find it to be too harsh. Cabin noise wasn’t non-existent – an exhaust drone was clearly audible, especially in sport mode – but it seems comparable to other SUVs in most normal driving situations. 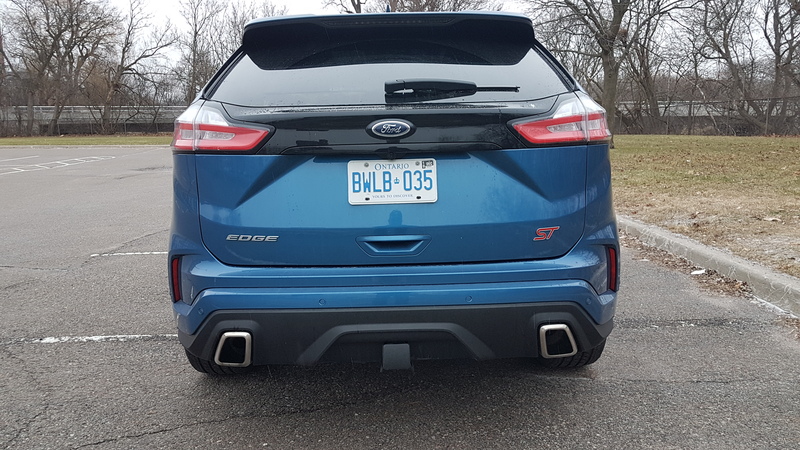 As far as handling is concerned, generally, it didn’t feel that much different than other SUVs, but I drove it in cold weather on winter tires on public roads. My impressions would undoubtedly be different in warm weather on a closed course with a test vehicle shod in sticky high-performance rubber. That said, from what I experienced the steering felt direct and the handling was composed and confident. 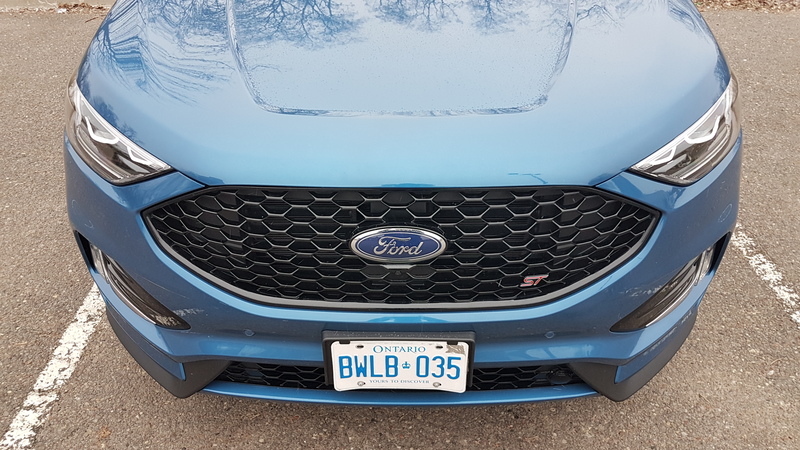 Overall, I come away impressed with the Edge ST. 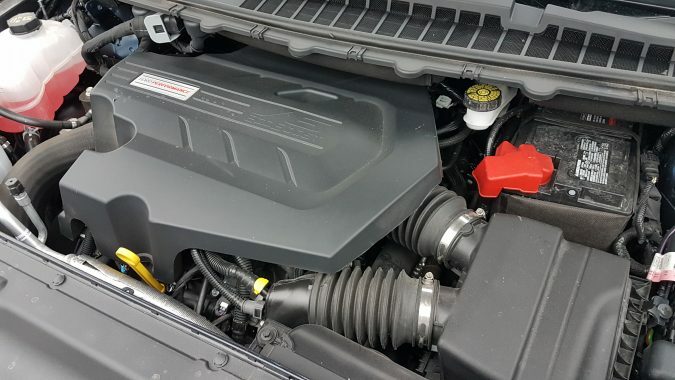 It delivers a near ideal mix of performance, style, utility and technology for a competitive price that will likely find favour with consumers. And soon there will be more to choose from with the recent reveal of the 2020 Explorer ST which will arrive later this year.